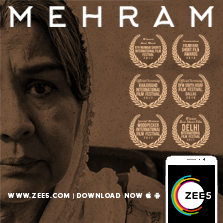 ZEE5, India's largest and most comprehensive digital entertainment platform for language content, released award-winning film 'Mehram' on the platform on 21st August. Starring revered actors including Farida Jalal, Sushma Seth and Rajit Kapoor in leading roles, the movie won rave reviews from critics across the world. Written and directed by Zain Anwar, the short film delicately delves on the freedom of a woman to follow her dream independent of male support. The protagonist, Aamna (played by Farida Jalal) burns with the desire to perform the Hajj but is crippled by a Saudi Arabian law that forbids women to travel for the pilgrimage without a male blood relative. The movie revolves around the characters in her life and her lone struggle to achieve the seemingly unattainable. Speaking about the release, Manish Aggarwal, Business Head – ZEE5 India said, “We are proud to bring a film like Mehram to the OTT audience, this Eid. Given the reach of the platform, we hope the film can go beyond the realm of entertainment to spark a thought and subsequent conversations among the viewers. ZEE5 has been at the forefront of bringing a range of unique content to viewers and the movie repertoire of the platform stands testimony to this. This boasts of popular films such as Padman, Parmanu and Veere di Wedding as also critically-acclaimed ones such as Mehram now, and many more in the pipeline. Since the launch in February, ZEE5 has been focussed on bringing content across languages that is relatable, understated, bold, progressive, introspective, layered and open to interpretation. The platform has curated 10-20 minutes' on-the-go and quick-natured content across genres such as Thriller, Drama, Action, Comedy, Satire, Biopics and Reality – in keeping with the preferences of the audience. Availability: The ZEE5 App can be downloaded from Google Play Store http://bit.ly/zee5 and iOS App Store http://bit.ly/zee5ios Also available at www.zee5.com, as a Progressive Web App (PWA), and on Apple TV and Amazon Fire TV Stick. ZEE5 also supports Chromecast. Pricing: Freemium pricing model with both free and paid premium content (including Originals) to cater to a mix of audiences. Viewers who subscribe to the ZEE5 subscription pack will get access to the entire library of content using the limited period special subscription offer - pay for a year and spend just INR 42/month.